The beautiful Rosalie was nice enough to come back from her wedding and answer all of our questions! She and her partner stayed at the Iberostar Playa Mita in Puerto Vallarta. This interview is short and sweet and may help future brides when it comes to picking a resort for their future destination wedding. So, without further a due, let’s read an Iberostar Playa Mita Bride Review! The resort was absolutely fantastic. Beautiful beach, pool! Service was amazing. Rooms and resort are clean and comfortable. We got married at the oceanfront gazebo. The reception/dinner was at the steakhouse. It was a scorching day. So, some umbrellas would have been nice to have for all our guests. No air conditioning at the steakhouse. Once again it was quite uncomfortable, but enjoyable all at the same time. Our room had a pleasant turndown service the night of the wedding. Use the spa service, hair and makeup were perfect! Using their service was terrific. 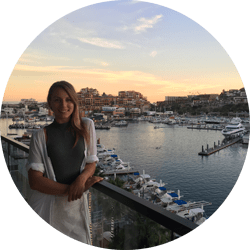 Did you like Iberostar Playa Mita Bride Review? Check out more here.